Oh everyone is going to be positively fawning over your little one in this outfit. What a sweet deer you have. Those antlers, that nose, his/her cute little fingers clasped with joy at discovering they've been transformed into a peaceful woodland creature. And what grace they will now exhibit after inheriting the best deer attributes. 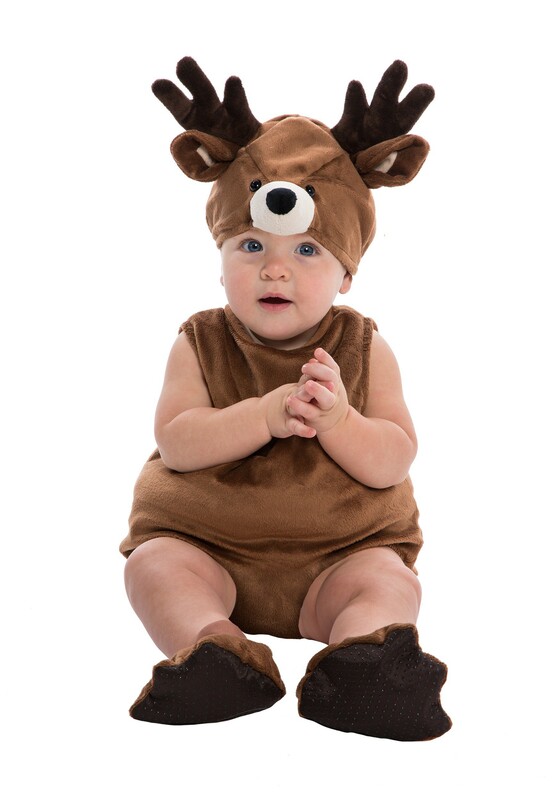 Instead of rolling or crawling, your little one might very well start prancing like only a deer can (probably not, but you never know the magic of the forest!). And what better way to teach your child the importance of the environment and protecting animals than by letting him/her be one! Take a walk in the woods while they wear their new favorite outfit. How do they react? Are they suddenly alert and on the lookout for predators? Do they canter across open meadows looking for a fresh stream? Do they lock horns with another young buck in order to impress females? You never know what is possible once your little one sets down in an enchanted setting. And who knows where it might lead. Maybe your little one will soon have dreams of being the best veterinarian to ever nurse a sick dog back to health. Or maybe they'll make nature documentaries on the exquisite grace of woodland creatures. Then again, maybe they throw a tantrum about having to wear those adorable little booties while you frantically try to capture a smiling picture. But the booties are so cute! If they could sit still for just a moment you'd have the memory you need. Fear not, parent. Graceful woodland creatures like your little deer are naturally photogenic. And you'll fawn over these doe-eyed pictures for years to come.